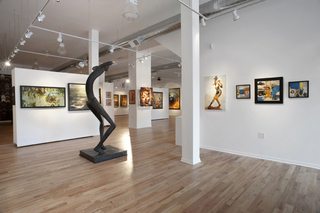 The Jackson Junge Gallery adds to the growing arts community in Chicago's Wicker Park / Bucktown neighborhood. 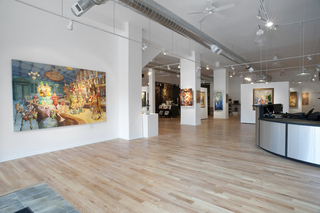 Co-owned by Chicago artist, Laura Lee Junge, and partner, Chris Jackson, the gallery provides an exclusive local venue for Junge's paintings and other works. Prior to the fall 2009 gallery opening, Junge's work received limited viewing at her studio, seasonal art fairs and through distributors outside Chicago. 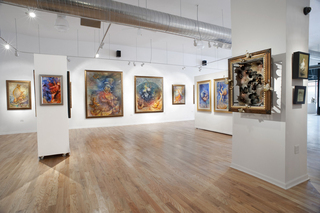 The signature gallery has introduced Chicagoans to a dynamic home-town talent who has earned praise from art lovers and critics alike. While the spotlight shines on Junge, the gallery presents work by other contemporary artists from Chicago and elsewhere. Guest artist exhibits are hosted throughout the year. 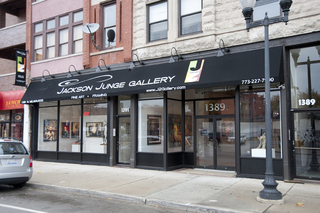 Located on a busy section of Milwaukee Ave. just north of Division St. and south of North Ave., the Jackson Junge Gallery attracts a diverse clientele. Everyone from the ardent art aficionado to the casual admirer, delight in the comfortable ambiance they find inside. In an effort to make art widely accessible, superior giclee reproductions and prints are available for purchase alongside original pieces. Today's sophisticated technology allows for exceptional quality prints. All of Junge giclees are produced in-house at the Jackson Junge Gallery and are subject to the artists' personal inspection. The Jackson Junge Gallery provides a full range of custom framing services on site. Under the guidance of skilled craftsman and gallery co-owner Chris Jackson, customers find the perfect mount, protection and frame for their art, photography and other treasures.